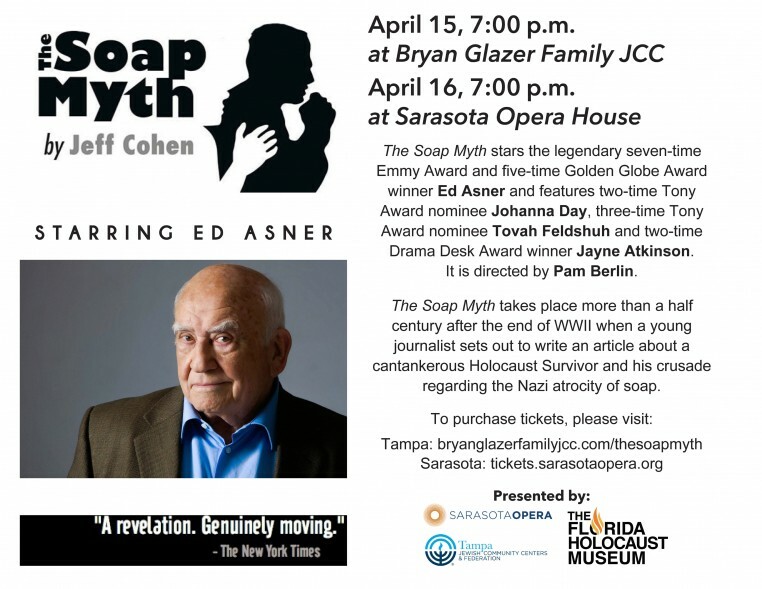 The Tampa JCCs & Federation, along with the Florida Holocaust Museum, are thrilled to present Soap Myth on Monday April 15 at the Bryan Glazer Family JCC in Tampa. The Soap Myth stars the legendary seven-time Emmy Award and five-time Golden Globe Award winner Ed Asner and features two-time Tony Award nominee Johanna Day, three-time Tony Award nominee Tovah Feldshuh and two-time Drama Desk Award winner Jayne Atkinson. It is directed by Pam Berlin. The play dramatizes the friendship that develops between a young Jewish journalist (Annie Blumberg) and a cantankerous Holocaust Survivor (Milton Saltzman) and poses the question of whether the Nazis made soap from the bodies of murdered Jews. The play tackles such provocative themes as how a Survivor survives surviving and who has the right to write history – those who have lived it and remember, those who study and protect it, or those who would seek to distort and desecrate its very existence. Ed Asner is beloved for such legendary roles as Lou Grant in The Mary Tyler Moore Show, Santa Claus in the Will Farrell comedy Elf, and Carl Fredrickson in the smash animated feature Up. This marks the third year that he will perform the role of Holocaust Survivor Milton Saltzman in The Soap Myth. Tickets still available for tomorrow night’s performance at the Sarasota Opera House.